AtomHDR Display. 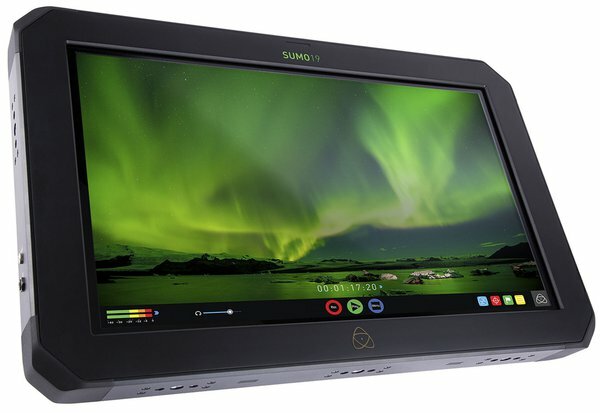 The Atomos Sumo’s monitor features a wide 10-stop dynamic range and a 10-bit signal processor, making it capable of mapping log footage, PQ, and HLG video feeds from popular cameras, game consoles, and TV manufacturers into vibrant HDR in real time. Daylight-Viewable Screen. By taking advantage of the monitor’s full 1200 cd/m² brightness, you can use the Sumo in the brightest of outdoor environments without requiring a hood. HDMI and SDI Interfaces. The Atomos Sumo offers full-size HDMI and SDI input and output ports, so that you can easily connect and convert among any combination of HDMI 2.0 and SDI (Quad 3G/6G/12G). The Quad SDI inputs support cameras with multiple 1.5 or 3G-SDIoutputs without converters. The HDMI 2.0 supports up to DCI 4K and UHD input and output and HDR automation, which includes the importing of camera settings. You also get Genlock and LTC timecode support. Pro Recording. Capture the raw data output from the Sony FS5, FS7, or FS700; the Canon C300 Mark II or C500; or the Panasonic VariCam LT over 12-bit DCI 4K in Cinema DNG, 10-bit Apple ProRes, or 10-bit Avid DNxHR formats. The Sumo’s high processing power lets it maintain the camera’s quality, with data rates up to 3.2 Gbps. Built-In XLR Audio. The Sumo’s built-in full-size XLR connections can power external mics, giving you balanced analog audio, dedicated meters, and frame-delay and gain adjustments. Phantom-powered mics and line-level audio are seamlessly synchronized, which means you don’t have to worry about matching in post. You can use the 3.5mm stereo headphone jack and built-in speakers for easy review. Gold Mount. This version of the Atomos Sumo includes (2) Anton Bauer Gold Mount battery plates. To help keep cost down and give you the most flexibility, we do not include any Gold Mount batteries or chargers with the rental. However, we do have a variety to choose fromthat are available to rent separately. Constant Power. You get two 4-pin XLR inputs for power, so that the Sumo can automatically switch power sources if one stops providing power. The Sumo also supports hot-swappable battery power via the included battery plates (batteries / charger not included). Versatile Use. The Sumo is essentially a jack-of-all trades, whether that’s out in the field on a DITcart, setup as a 1st AC monitor / Director’s monitor, or in the studio for the editing workflow. Whatever your needs, there’s a good chance it will excel. We include the standard desktop feet for tabletop use, as well as a Matthews VESA Monitor Mount for use on C-stand (not included). While quad-input recording and switching are supported on paper, it’s more difficult to set up than Atomos’ documentation makes it seem. We don’t yet carry the accessories necessary to make it work, so we can’t recommend this product as a switcher.